With her debut collection Infinite Citizen of the Shaking Tent, Liz Howard became the youngest winner of one of the world's richest poetry awards. 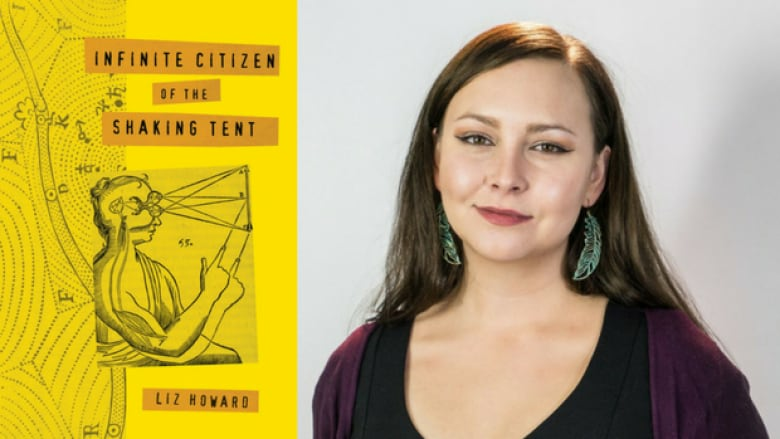 With her debut collection Infinite Citizen of the Shaking Tent, Liz Howard became the youngest winner of the Canadian Griffin Poetry Prize, one of the world's richest poetry awards. The judges praised Howard for her "penetrating intelligence and playful musicality." Now based in Toronto, Howard grew up in Chapleau, an isolated rural town in northern Ontario, in a house bordered by a highway, swamp, graveyard and boreal forest. In her own words, Howard describes how her upbringing in this landscape has made an indelible mark on her identity and her poetry. "Growing up, the only literature we had were the Bible and the Sears catalogue. I remember going down to the basement and nosing around in all these boxes down there and finding a box of books that my mom had. My mom dropped out of high school when she was 16 and I guess she didn't return any of the books. There was a copy of Shakespeare's Macbeth in there and I fell in love with it. I had just learned how to read and I'm not saying I could understand everything that was going on in there, but I thought it was such a cool story. I loved the language of it and the poetry of it, but I didn't have a sense of what poetry was. "Then my best friend took me to the town library when I was 10 and no one had ever taken me to the library before. I was absolutely ecstatic... I couldn't believe how many books there were. There were hundreds of books under all these different subjects. I gravitated toward the theatre section because I knew about Shakespeare. The theatre was close to the Canadian Poetry section. I took out books by Susan Musgrave, Margaret Atwood, Leonard Cohen, Dennis Lee and I completely fell in love with it." "A lot of people ask me, 'What kind of poetry do you write?' I have no idea how to answer that question. I experiment with language, but what does that mean to the average person? I say, 'My book is deeply personal.' It's about growing up as a biracial person in Northern Ontario, not fully able to engage with my Indigenous heritage, being separated from the Indigenous side of my family. My father left when I was quite young. I write about growing up with that knowledge and trying to make sense of things. "I don't know why I have the abilities that I have. Why I was successful in a traditional scholastic environment, why I had a facility for language, why I loved books. So many of my relatives, it's not the case for them. A lot of them are struggling greatly with substance abuse and trying to maintain custody of their children. Here I am in Toronto, getting an award for writing what probably seems like a lot of nonsense. "The things I write about, they're usually not elevated to the level of literature. They're usually a sad story on CBC. I feel like I get a lot of being able to tell my story. Growing up, my mother's main concern for me was that I graduate high school without getting pregnant or getting sent to juvie. That's the context I come out from." "I grew up in a house on the side of a highway between a swamp and a graveyard, with the boreal forest stretching all the way up to James Bay just behind me. I spent so many hours playing in that bush and writing in my diary. I'm really formed by that landscape. It's indelibly pressed itself into my consciousness, into my body, my physicality. I feel like I carry it. Even though I spend the vast majority of my time here in Toronto, I still carry that within me." "It's sort of paradoxical but I feel that poetry allows me a kind of precision by way of ambiguity that I could not find in prose. I work a lot with what is called parataxis, where you pair seemingly unrelated things together and it changes the meaning of each thing. That to me, the experiential product of that gulf for the reader is closer to the truth than if I tried to say what I meant in plain language." "We have a ground floor apartment in Roncesvalles village and there's a little porch area. It's very small but it's enough for a little table and a couple of chairs. I get an hour or two of heaven sitting here on this little patio and writing in my notebook. "I like to think historically — perhaps not the cement where I'm sitting, but somewhere down there is the floor of Lake Iroquois, which inevitably recessed into Lake Ontario. I like to think back in deep history that I'm seated somewhere that used to be near the bottom of the lake and ancestral Indigenous people may have been paddling above my head hundreds of years ago. I always try to Indigenize the space I'm in. I like to be out here and reflect on that and be in a quasi-natural space. We're all interrelated and interconnected and transnational and transidentified eternally, in this space, in this mash, this matrix of humanity and ecology. Being seated in this place reminds of that. I can get too much in my own head sometimes. Being outside in the larger world and watching young children and families walk by and seeing the sun set, gives you a different perspective." Liz Howard's comments have been edited and condensed.